Are political authorities back? Many high-tech and cyber related signals emerged this week, from the massive DDoS attack to digital arm trade, right to kill hackers, DNA computing, quantum technology or space entrepreneurs, besides the possibility of renewed attacks by “climato-skeptics,” when scientists wonder if the frozen spring could be linked to a slower gulf stream, and when political impacts of natural catastrophes start being studies more consistently. Meanwhile, the Syrian quagmire deepens, progressively dragging the region in, and tensions in Northeast Asia heighten. And at the core, because strong political authorities are crucial to deal with those multiple challenges, Cyprus as a potential signal of finally awakened “rulers,” taking income where it is rather than impoverishing further their capabilities and support base, a new episode in the age-old struggle of the fight between rulers and wealthy, liquidity awash elite. Click on image to read on Paper.li. 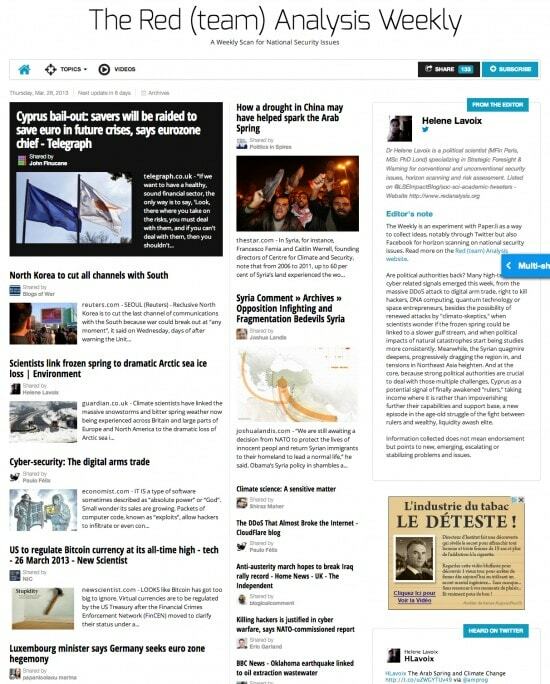 Posted byDr Helene Lavoix (MSc PhD Lond) March 28, 2013 February 5, 2014 Posted inThe WeeklyTags: Arab Spring, austerity, Bank, bitcoin, BRICS, China, computing, crisis, Croatia, cyber-security, Cyprus, digital arms trade, DNA, drone, earthquake, Egypt, Elite, environment, Euro, fracking, GMO, Google map, Greece, hacker, Israel, Middle East, Monsanto, NATO, North Korea, protest, quantum, revolution, Shale, Spain, Syria issues, tension, Turkey, U.K., U.S.